Sun Valley Community School students, faculty, and staff come together as a community, celebrate our unique school culture, and show our Cutthroat pride through these much-loved annual traditions. 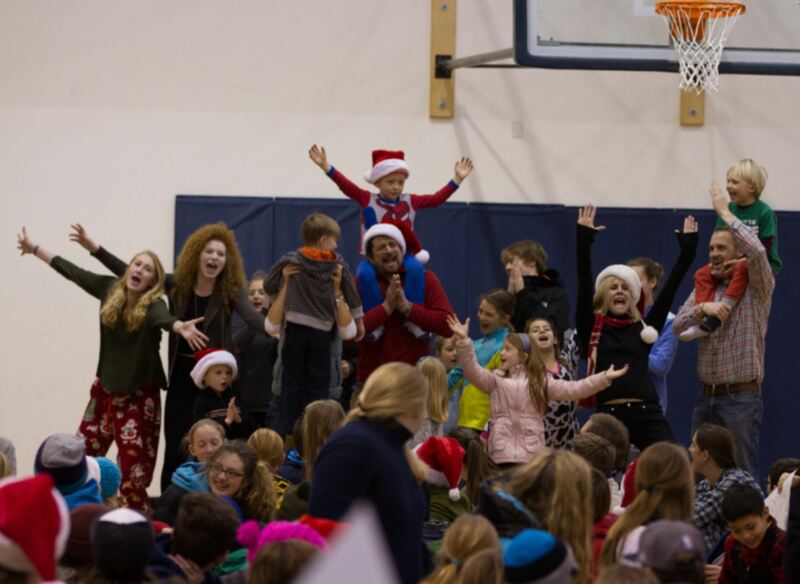 Named for Peggy & Sigi Engl, two of Community School’s founding supporters, Engl Cup Ski Day is one of Sun Valley Community School’s oldest traditions. On the day of the event, students gather on Dollar Mountain in their color groups, dressed in wacky costumes, participate in a mountain-wide scavenger hunt, and come together at the end of the morning for a school-wide barbecue. In recent years, the Student Senate has added a “Bucket Challenge” fundraising component to the tradition, which each year benefits a local nonprofit organization. As a pre-kindergarten through twelfth grade school, Sun Valley Community School offers students the opportunity to regularly connect across ages and grade levels. While many of these meaningful interactions are casual, organized events bring students together intentionally in color groups—small, cross-divisional groups that include 2-3 students from each grade. Color group activities range from service learning experiences to spirit week events and build lasting connections among students and between faculty and students. Each fall, Sun Valley Community School Elementary School students have the opportunity to share their school day with a grandparent or special friend on Grandfriends’ Day. The day is a highlight for our youngest Cutthroats, who introduce their grandfriends to teachers, show them around campus, share class projects, present a special musical production, and come together for special lunch. Festive spirit fills the Fishtank during the annual K-12 Holiday Sing-along held each year in the week before winter break. Color groups join voices to sing and share the merriment of the season in this fun, energetic celebration of the holidays. In 1974, during Sun Valley Community School’s second year, the Wood River Valley got hit with a foot of fresh powder. The bluebird sky and irresistible new snow inspired students and faculty to call for an all-school ski day. Powder Day was born. In the years since, on one eagerly anticipated day each winter, students and faculty still meet up to ski together and celebrate school spirit on skis. Cutthroat pride shines especially bright during one week each term when students and faculty across all three divisions participate in activities created to bring the community together and build school spirit. Dress-up days, dodgeball games, athletic events, and general widespread blue-and-white merriment marks these weeks. Go Cutthroats! Each fall, Sun Valley Community School fifth graders assume a much-anticipated responsibility when they are paired with a kindergartener, or "K-Pal." Once paired, the duo spends time together throughout the year, connecting through organized activities and informally when they spot one another on campus. The traditions at our school—like Engl Cup—are really unique and contribute to our personality. Combined with our academics, these traditions really set our school apart.